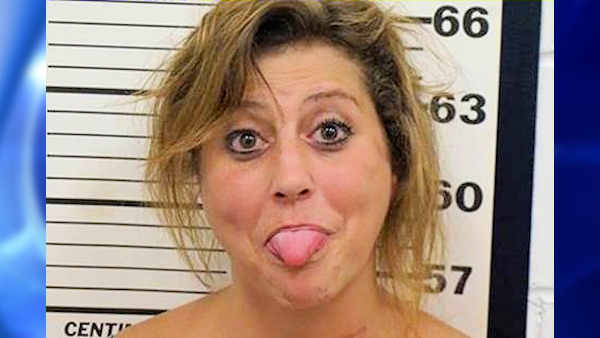 SPOTSWOOD (WABC) -- A woman arrested in New Jersey on charges of public nuisance, public consumption of alcohol and interfering with police stuck her tongue out at the camera during the taking of her mug shot. The incident happened just after 9 p.m. on August 21 on Main Street in Spotswood. Upon arrival, officers came in contact with Sheriann and Michael Depinho and Ester Nitch. Police say all three subjects were publicly consuming alcohol in the parking lot, as Sheriann Depinho was playing loud music from her vehicle and creating a disturbance. As police made contact with the suspects, Sheriann allegedly began yelling at the officers, refusing to comply with their orders and refusing to turn down the music. Authorities say Michael Depinho also refused to follow orders as he protested and escalated the situation. All three were transported to police headquarters, processed and released with a pending municipal court date.